By offering comprehensive tips on everything from toilet training to developing good habits for bedtime, as well as disciplinary techniques to control aggressive behaviors, Making the “Terrible” Twos Terrific! approaches parenting in a straightforward, accessible manner that is easy for parents to implement and achieve success with their toddlers. In a completely revised and updated edition of his classic parenting guide, nationally recognized expert John Rosemond offers practical, tantrum-free methods for raising toddlers and getting them through the “terrible” times from age eighteen to thirty-six months. Focusing on the developmental period spanning age eighteen to thirty-six-months, which renowned parenting expert John Rosemond dubs, “the twos,” Making the “Terrible” Twos Terrific! 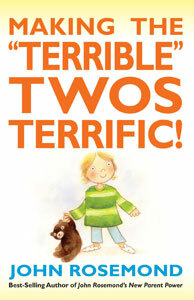 offers practical parenting advice to ensure that every child’s “twos” are terrific.